I am known for many things: Larger than life personality, lover of all things gold, Southern Belle, ability to bust into dance moves at anytime and for always being tan. I LOVE the sun but I know how awful it is for me so I took it upon myself to perfect the self tan. Now I’ve tried them all from extremely expensive to super cheap. 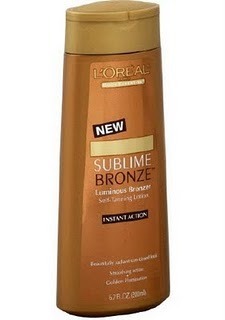 I have found the magic formula is L’OREAL SUBLIME BRONZER. It has Vitamin E for smooth skin, streak free, and adorable sparkles after you apply! #2. Start with you face. Put hair in ponytail. Use a dime size amount of L’OREAL SUBLIME BRONZER and your everyday moisturizer. I use Aveno. Rub together and apply. Make sure you get in your hairline, all the way down your neck, and your ears. #4. 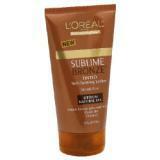 Next use half L’OREAL SUBLIME BRONZER and half body lotion (your choice of lotion) to blend together in your hand. Then start at your feet and move up to your upper sternum. Be very very careful around your toes, ankles, knees. #6. Lastly I do my collarbones and arms. I double check under my arms and make sure my collarbone and neck match. If you think your face looks a little too pale you can wash your hands and use a SMIDGE more on your face combined with your daily moisturizer. Remember the color will darken over the next 30 minutes. #8. I air dry (or you can use a hairdryer) and then go to sleep with this on. The next morning wake up and shower. If for some reason you have messed up you can always cut a lemon in half and use the citric juices to rub in your mistakes. It works miracles. Please take this knowledge and spread the word. Here’s to the whole world looking stunningly bronze!